This is the third guide I've ever created and I wanted to start with a short introduction about myself and the hero featured in this guide, Viper the Netherdrake. Alright, enough information about myself, let's go back to Viper! This is one of my most played heroes and I can say that he's always been strong no matter the patch or meta. Viper is great at every stage of the game and he's very dominant in lane. He's durable, his damage output is scary and he's a pain to play against. The pick and win rate of Viper is best throughout 2.000 - 4.000 MMR and it starts decreasing starting from 5.000 MMR. This happens because Viper is relatively easy to play but difficult to play against, thus being popular and strong in the lower brackets. However, in the higher brackets he's still strong but players tend to know what to pick and how to play against Viper. Taking all of the above into consideration, you should pick Viper against low mobility heroes that cannot escape efficiently. Since Viper is able to deal great amounts of damage to single targets, casting his ultimate on an enemy hero should most of the times result in an easy kill. However, targets like Anti-Mage, Queen of Pain, Lycan and so on can efficiently escape Viper's grasp thanks to their abilities. 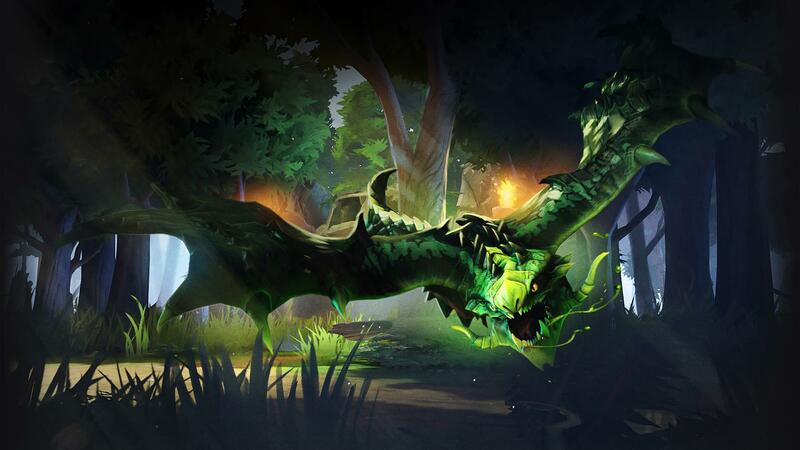 Since Viper is strong against single targets, naturally he's going to have a hard time against heroes like Phantom Lancer, Chaos Knight, Terrorblade and basically heroes that require split attention and area damage to be dealt with. The great damage output I've mentioned before is mostly all physical damage. If your team composition consists of mostly physical damage, then it might not be a good idea to pick a hero that deals even more physical damage. Try to always keep it balanced! If you already have strong magical damage dealers, then Viper can be a great hero to balance the magical - physical damage output. Always think through every aspect before picking Viper! Make sure to take note of everything that's going on when playing Viper and AGAINST Viper. I'm saying this because even when you're playing against Viper you can find out more of his strengths and weaknesses. You're playing Viper and you're having a hard time? Try to understand what's happening and what's causing the trouble, this way you can learn more and improve your game sense, thus being better at playing with and against Viper. Always be creative, smart and open minded! Alright, let's discuss the skill build displayed above. Usually skill builds are complex and situational, but for Viper it's pretty standard and that's a good thing, easier to learn and play! I like to follow the standard 1 - 1 - 1 start with a point each in Poison Attack, Nethertoxin and Corrosive Skin. The most popular approach is maxing out Corrosive Skin first since it increases your resistance to magical damage and it greatly punishes enemy harassment. You're going to be able to efficiently harass the enemies since if they try to fight back, they'll be slowed and they'll receive even more damage per second by doing so. This is difficult to play against and in most of the cases and lanes the enemies will avoid harassing you thus allowing you to easily farm. Moving on, the second skill that I prefer to max out is Nethertoxin. It's a very interesting ability that deals a good amount of damage, reduces the enemies magic resistance, applies break and it can be used to block paths. Great skill! Poison Attack is great for chasing and harassment, but usually a single point in it in the early game is enough to get the job done. Also, very important to know and to take advantage of, if you're using regular attacks to harass the enemy heroes, their allied creeps will start attacking you in order to defend their allied heroes. However, if you're using Poison Attack to harass the enemy heroes, the creeps won't react thus allowing you to efficiently deal damage. Okay, let's move on to Viper's talents and which options are the strongest. At level 10 we have to choose between +20 attack speed and +8% spell life steal. I believe Viper doesn't deal enough magic damage in order to benefit efficiently from the spell life steal, so I prefer to go for the bonus attack speed since it will boost Viper's damage output. At level 15 we have a choice between +100 Attack Range and +6 Corrosive Skin DPS/AS slow. Having some extra strength for Corrosive Skin is nice but I don't think only +6 increase does much of a difference. I would pick it in some situations when I think that I die too quickly, but besides this scenario I would pick almost all the time the bonus attack range, it will help greatly in fights and when attempting to siege the enemy base. At level 20 we have an interesting talent that allows Poison Attack to be cast on buildings. This can be really strong taking into consideration the latest changes applied to Poison Attack. The +100 Viper Strike damage per second increase isn't really that great to have at level 20, but you can go for it if you feel it's strong enough and worth to get. And now the final pick, the level 25 talent! We have the option to pick between +120 damage and Nethertoxin silence bonus. Nethertoxin has been changed into an interesting ability and it can be really strong if you have someone to disable the enemies and keep them inside your Nethertoxin. However, I rather go for the great boost in damage that will surely increase Viper's Strength without relying too much on setup and enemy mistakes. Great starting item to increase your damage and durability! Since it's a relatively cheap item, you can buy two or three of these to boost your early game strength. Stats make a huge difference, especially at the early stages of the match! Should provide you with sufficient health regeneration in the early game. Feel free to buy a Healing Salve or even another set of Tango in case you need more early regeneration. The most picked up item on Viper. The attack speed synergies well with your Poison Attack and you can switch between stats whenever you need more strength, agility or intelligence. Usually I take advantage of the strength bonus because it grants 200 bonus health, but keep in mind that agility grants extra 10 damage and attack speed and a bonus of approximately 1.43 armor. In case you're short of mana for your ultimate, remember that switching to intelligence grants you a small mana pool boost. Strength, agility and attack range, everything that Viper and theoretically any ranged core can greatly benefit from! Make sure to pick this up and upgrade it later into Hurricane Pike. Even more strength and agility, but this time we're getting some other bonuses too. The boost in movement and attack speed will be great since Viper isn't that mobile. Sange and Yasha will make you more durable, it will increase your damage per second and it will improve your mobility. Perfect fit! The item that enables Viper to unleash himself in fights! It will protect you against heroes that will try to disable and keep you under control. Activate Black King Bar mindfully and take advantage of each second of magic immunity! Take care against abilities like Savage Roar, Black Hole and so on, there are many counters even to Black King Bar! A strong counter against physical damage dealers. You can disassemble Sange and Yasha to easily build Heaven's Halberd. However, if you choose to do so, make sure to take advantage of Yasha and upgrade it into Manta Style. You already return damage when you're being attacked, but Blade Mail can punish your enemies for attacking you even more! If you're against heroes that deal heavy damage, especially burst damage, make sure to make their life harder with Blade Mail. I don't see this item picked up too often, but I really enjoy it myself. It will protect both you and your teammates from physical damage and it increases your durability. Great item against heroes like Phantom Assassin who rely heavily on physical damage output. As previously mentioned, you can disassemble your Sange and Yasha to build Heaven's Halberd and Manta Style. Whenever you're in need of either of these items, go ahead and disassemble Sange and Yasha so you can get them quicker. Manta Style is great when you need some extra pushing power and because it dispells plenty of negative buffs and silences. If you're having a tough time dealing with magical damage, then Pipe of Insight is one of the best choices in this situation. It will make you even stronger against magical damage and it will protect your teammates as well with a magical shield. I like to pick this up whenever I'm against heroes that deal physical damage and have a lot of armor. For instance, if you're against Dragon Knight and Sven, this will both decrease their damage output and greatly reduce their armor, thus making them easier to kill and survive against. If you have no invisibility potential at all in your team, you can go for a Shadow Blade if you feel you can play aggressively. It will allow you to scout the map, get easy kills and it will force the enemy team to spend lots of gold on detection. Make sure to upgrade it later on into Silver Edge. You already have the Dragon Lance, so this should be easy to pick up. It will grant you more mobility and you'll be able to kite your melee enemies efficiently. This item has a win rate of approximately 58%, very great pickup! One of the best agility items in the game, the Butterfly offers agility, damage, attack speed and evasion. Very strong item that has a win rate of over 70% when picked up by Viper! Whenever you're against evasion you should pick this item up as soon as you've got your core items. It will grant you accuracy that increases your chances to hit through evasion and deal bonus pure damage. Great against Windranger, Phantom Assassin, Keeper of the Light and items like Solar Crest, Radiance and Butterfly. I've mentioned before that there are heroes that can easily escape Viper thanks to their abilities. This item fixes that problem and increases your damage output even more, whenever you're against heroes like Storm Spirit, Queen of Pain, Anti-Mage and so on, this is a great pick to shut them down and keep them under control. However, in the case of Anti-Mage at least, he will most probably pick up a Manta Style thus allowing him to dispel the silence. Keep that in mind! The best item for durability and health increase, the mighty heart! It grants 40 strength and 500 health, meaning a total of 1300 health and 2.4 health regeneration. Also, whenever you're not in combat you'll receive a 7% max health regeneration. If you've picked up a Shadow Blade earlier then you'll need to get this item eventually. However, there are situations where Silver Edge can win you the game. The active ability of Silver Edge enables regular attacks to apply break to the target, thus disabling their passive abilities. This is great against Slark, Bristleback, Broodmother and many more! More damage, armor and health regeneration, everything that Viper needs! It will greatly increase your damage output while making you more durable, but even better, it will grant you an active ability that dispels and mutes the target you use it on, very powerful active. Thank you RadwanX for the suggestion! You've picked the mighty Viper and the opponents have already panicked. What to do next? Since Viper is strong on the lane he can basically go to any lane he needs to. However, the best lane for Viper is the mid lane. He's great against almost all the other mid heroes and the extra farm and experience surely helps. Farming quickly his core items will enable him to snowball and be a real threat to the enemy team. In the early game it's very important to farm efficiently and not miss last hits. By last hits I'm referring to both creep kills and creep denial. While it's important to gain gold and have a higher net worth than the opponents, it pays off to deny your allied creeps and limit the experience that the enemies are gaining as much as possible. For instance, let's say both you and the enemy hero you're facing are at level 5. If you have more denies that the enemy hero, you will certainly get level 6 faster than the opponent, meaning you will have your ultimate and the enemy hero won't. That's in most of the cases a great opportunity to get a kill since your ultimate deals a lot of damage and slow. Be efficient and make the most of the laning stage! Keep the lane equilibrium by not pushing the lane and by blocking your creeps when needed. It's important to have the creeps on your side of the map since it's easier to retreat in case of ganks and because it forces the enemy hero to cross his side of the map in order to farm. This can also create opportunities to get kills since it forces the opponent out of position. Keep that in mind and play smart! Since your Corrosive Skin damages the enemies for harassing you, make sure to use this to your advantage. Whenever you're trading hits with your lane adversary most of the times the damage exchange will be in your favor. They will deal a fixed amount ofd damage while your damage will be increased by both Nethertoxin and Corrosive Skin. Also, don't forget that Corrosive Skin applies a great slow to movement and attack speed, thus reducing mobility and damage per second, enabling you to win most 1 vs 1 fights. Once you've reached level 6 - 7 so to say you can start looking around the map for opportunities. You want to aim to get kills and help your teammates win their lanes. Viper shouldn't have any issues in the early game since he's very durable and his damage scares most heroes, so take advantage of the moment to get as much leverage as possible for you and your team. Watch the map, try to get kills and assess your dominance over the lanes! In the mid to the late game you've basically got the same concepts that you have to keep in mind and follow. While you're very strong and durable, the game is still 5 vs 5 and you can always get killed if you're alone or out of position. Make sure to play together with your team and use your abilities in the best interest of your team. Since you're very durable and you reduce the movement and attack speed of the enemies when attacked, you can take advantage of this by staying in the front line and being the core of the fight. Since you're going to be the highest threat in most cases, the enemy team will try to focus you and kill you quickly before you can unleash your poison. Try to position yourself in such a way that the enemies are focused on you but you're still able to fight back while the pressure is taken of off your team thus enabling them to fight and be as effective as possible. Even if you might die in some fights, it's important for your team to win the fight and take objectives after doing so. Never discourage yourself for getting killed as long as you died for the team! Let's have a scenario as an example. You're pushing the mid lane together with your team in attempt to destroy the tier 3 tower and take down the enemy barracks. In this case you can either slowly take down the tower from a distance, dive the tower or wait for the enemies to initiate. In either case, when your team initiates or when the enemy team tries to make the first move, make sure to draw attention from your team. This way the enemies will get slowed by your Corrosive Skin and they won't be able to be as effective as they should be. Also, even if it applies to almost every situation, always in a fight try to establish which is the top priority target and make sure to focus that target down. However, if there are other factors that seem more important on the spot, make sure to focus on them instead. You're against a strong Phantom Assassin that mows down your team in a few hits? Cast your ultimate on her, that will greatly cripple her mobility! Take advantage of your Monkey King Bar and deal as much damage as you can to her, if you kill her fast then the enemy team's damage output will severely decrease! Phantom Assassin is not in your range and the enemy supports are disabling your team? They're squishy, finish them quickly and then move on to Phantom Assassin! Learn from every match and try to improve your decision making and game awareness. No matter the hero or the meta, having a developed game awareness and ability to learn will greatly improve your DotA and overall gaming skills! I hope you've enjoyed my third guide and I'll make sure to keep this guide updated as soon as the patches are released. Good luck and have fun dominating!